Latitude 50.333648. Longitude 5.523543. The Neolithic dolmen or burial chamber called Dolmen de Weris no 1 is located near the northern end of the Rue des Dolmens highway in the area called Durbury – close to the Morville and Tour country roads, about a mile to the north-west of the little village of Weris, in the Wallonian province of Luxembourg, Ardennes, eastern Belgium. The megalithic structure stands beside the road partly hidden by trees and is easily missed. 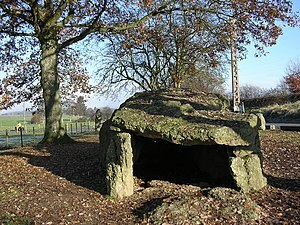 This burial chamber is called the Northern Dolmen, Allee Couverte Norde, or Dolmen de Nord. Running in a straight line to the south there is an avenue or double row of menhirs (standing stones) – the monument more or less forms the northern junction of the megalithic avenue itself. This ancient monument is an impressive structure standing at 5 feet high made from pudding-stone with a massive capstone, sadly now broken, weighing 30 tonnes. It is supported by four huge rectangular-shaped stone blocks or orthostats, two of which weigh up to 20 tonnes. There is an equally impressive gallery (corridor), although quite short, and a rectangular-shaped ante-chamber 33 feet long, which has suffered some damage. At the eastern end there is a blocking stone, while at the western end a wide portal (entrance) where, on the ground lies a recumbant stone, which originally blocked-off the entrance? Just inside the entrance is a strange curved stone (half-moon shaped) that is broken down the middle. This is called a ‘spirit hole’ or ‘kennel hole’. Near the eastern side there is a single standing stone or, what is perhaps a ‘mark stone’. Originally a mound of earth lay on top of the dolmen but this has now gone. There are a total of 16 stones at this site, which is said to date from 3,000 years BC. At the south side of the dolmen are two stone rows or an anvenue of 30 menhirs that form an alignment with this – the northern dolmen – and with a curious stone to the north-east called ‘the Stone of the Ancients’ or ‘White Stone’ that is often referred to as a standing stone but, in fact, it is a naturally-formed stone some 3 metres high that leans at a 45 degree angle and stands on a hillside. At the bottom of the hill another stone ‘the Devil’s Stone’ or ‘Devil’s Bed’ is a flatish stone that is 0.6 metres high by 2.45 metres long. About 2 miles to the south-west near the Route de Erezee (N841) north-east of Wenin we have the Weris (Southern) Dolmen no 2 which is, sadly, now collapsed although the entrance is still quite noticeable. This dolmen is a collection of 20 stones 23 feet long and in a very ruinous state, but similar to the northern dolmen in that it is also a gallery-tomb. In 1906 the northern Weris dolmen was excavated. Parts of three skeletons were discovered along with other artefacts. However, its stones were not put back into their original positions (in situ) and other damage was caused to the monument. Though, by the looks of things, the archaeologists haven’t done such a bad job! The huge capstone was probably broken at this time as was the spirit-hole? Categories: Allee Couverte Norde At Weris In Belgium, Burial Chambers / Cromlech / Dolmens, Dolmen, Dolmen de Weris Province Of Luxembourg | Tags: Dolmen de Weris in Wallonia Belgium | Permalink.